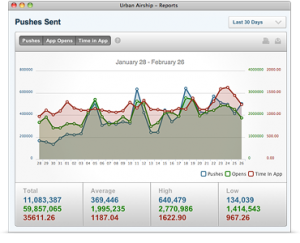 Urban Airship came out with some new push notification tools this week, including services that allow you to slice-and-dice your mobile application audiences by location, time, context and preference--allowing you to improve the relevancy and targeting of messages and offers. a national retailer could off-load excess inventory held by various stores by targeting offers to people in those cities or multiple ZIP codes that have a preference for that product category. a sports or entertainment venue could target people that are nearby right now to drive attendance on a slow day, or offer longer-term promotions for people that were visitors within the last six months but not in the prior three months. a media site could define custom segments called Travelers or Movers based on changes in cities, states or countries over time, and bolster its breaking news pushes with useful local content. The new Urban Airship products are Push and Rich Push® composers, allowing users to construct targeted segments that join location information with in-app behaviors, preferences and device profiles. 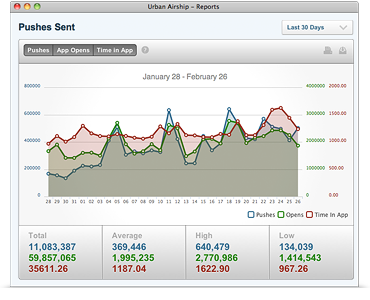 The entire Urban Airship platform which now includes Push Notifications, Rich Push, Push Composer, In-App Purchase, Subscriptions and Reports, has API access for developers, including iOS and Android libraries ready to go. I’m adding Urban Airship to the CityGrid Local, Mobile Stack and will be weaving more of their services into what we offer here in the CityGrid Developer Center as well as our hackathon tools.